Gary Moore is perhaps best known as a blues guitarist, but he also made a big name for himself as a jazz rock and rock guitarist in Colosseum II and Thin Lizzy. 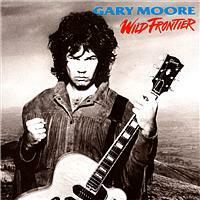 Before his solo career took him on a trip through the world of blues, Gary explored some melodic hard rock as well. One of the better efforts to come from this period was Wild Frontier, which is often described in derogatory terms. But was it really such a train wreck? Quite the opposite, I feel. The album continues in the same rock (almost AOR) style as Run for Cover, which is often hailed as Gary's crowning moment during this musical period of his life. Supposedly, Gary was just going through the motions on Wild Frontiers, which is made even clearer by the use of the drum machine throughout this album. I think this is a false assumption. The album feels way more personal and full of energy than the overcrowded Run for Cover, where the amount of musical talent on display was staggering, but it also seemed to get in the way of creating memorable melodies. On Wild Frontier, Gary decided for a totally different approach, with only a couple of musicians helping him out and was able to create melodic rock as it was meant to be – to the point and without any embellishments. Admittedly, real drums would have made it better, but that's part of the charm of this record. The drum machine isn't distracting in the least and actually serves to emphasise Gary's abilities as guitarist and, yes, even vocalist. The album is mostly played in a typical melodic rock fashion, with fast, almost shredder-like guitar solos. Moore, being from Northern Ireland, often used Irish folk motives and this was the case here as well. He incorporates them into the rock format so effortlessly that you have to take your hat off to him. This is especially clear on the famous Over the Hills and Far Away, which was later covered by Nightwish. Moore does give in to his love for blues as well on the somewhat sterile Loner, which is really no indication of the blues talent he would show us later on in his career. Wild Frontier is an intimate album full of Gary's personal touches. The guitar playing is excellent throught and also very tasteful. He never takes his shredding to the point where you become sick of it. At the forefront is his great songwriting ability, which has always been of the highest calibre, whether he was playing jazz rock in Colosseum II, hard rock in Thin Lizzy, melodic rock in his solo career or blues. The guy always had credibility and a great presence. If you're looking for an AOR or melodic rock fix, look no further than Wild Frontier to scratch that itch.